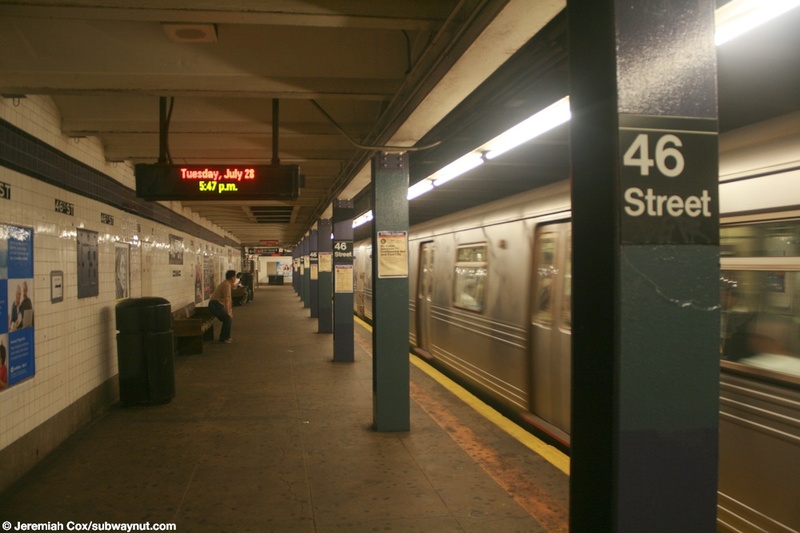 46th Street is a local station on the IND Queens Blvd Line. 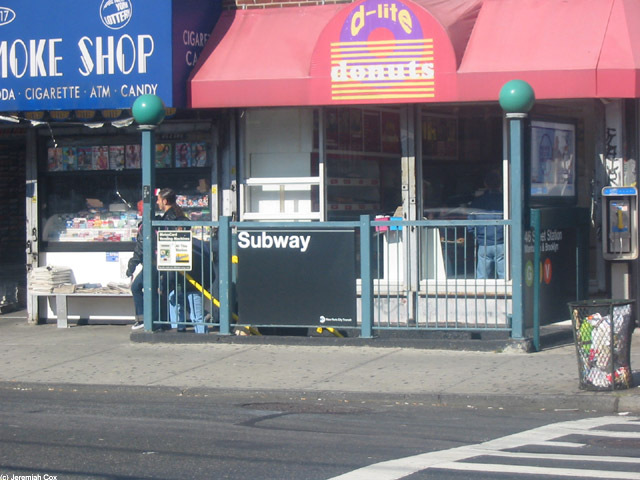 The station is located in the section of the line where the express tracks have left the local tracks to take a more direct route via Northern Blvd. This means the station's appearance is two side platforms for a two-tracked local line. The station is located just below street level and no free change of direction transfers are provided. 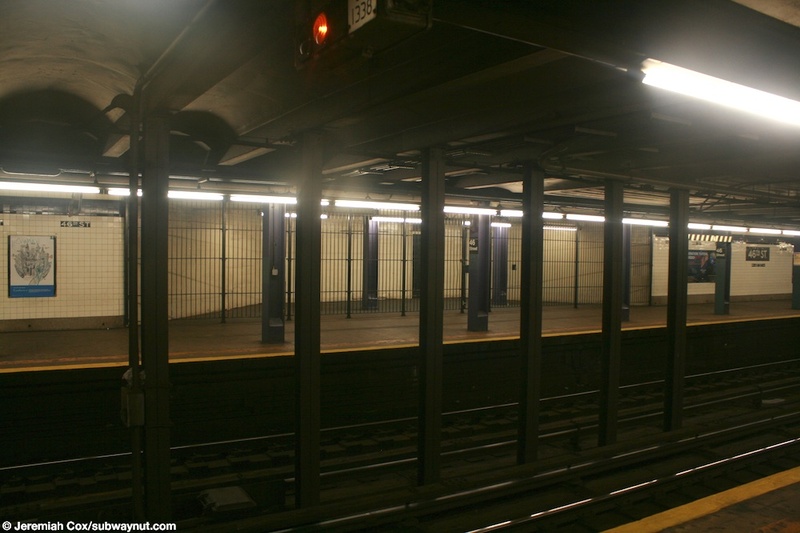 There are two exits from each platform. 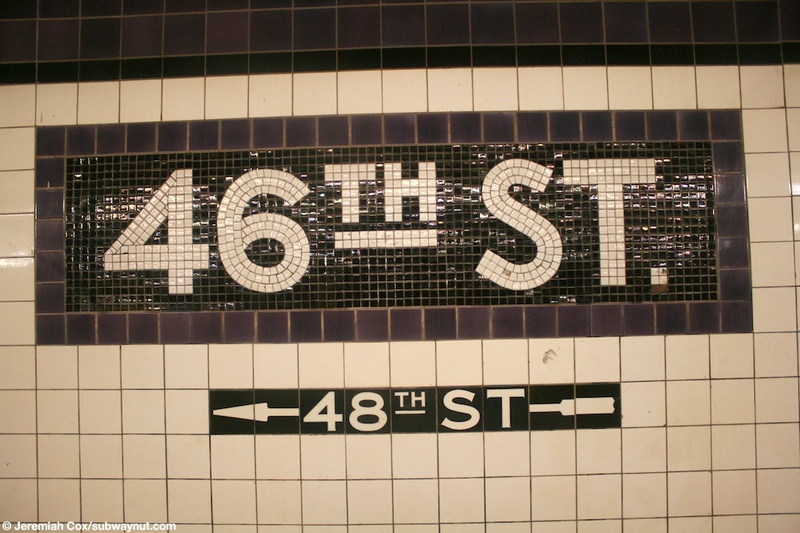 The main ones are at the western (railway southern) end of the station to 46th Street & Broadway, a single staircase from the NW corner leads down to the 24-hour token booth and turnstiles on the Manhattan-bound side of the station. 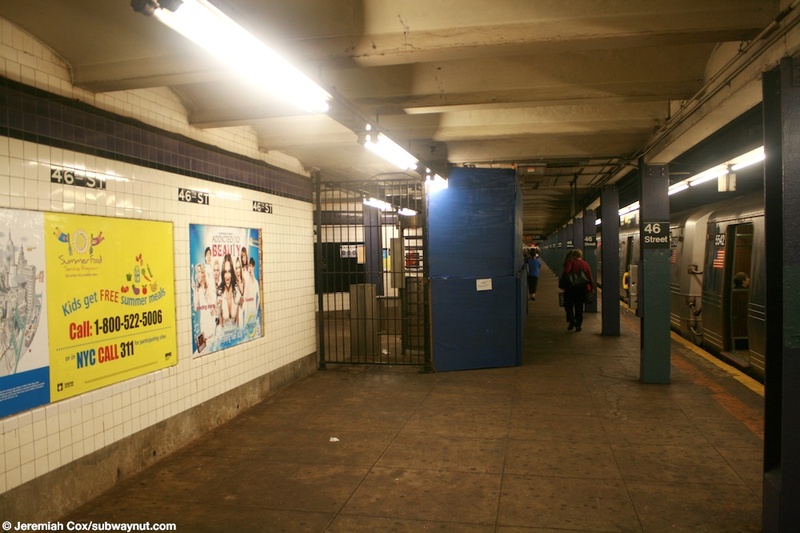 The Forest Hills-bound platform's street stair is at the SW corner, it leads down to a part time token booth and bank of turnstiles with two High Entrance/Exit Gates for acess at other times. There are secondary exits at the eastern end of the station. 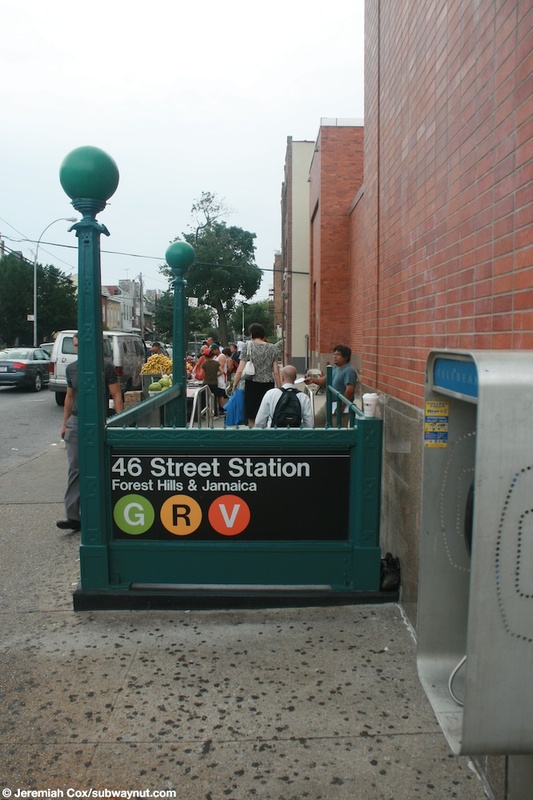 The Forest Hills-bound platform has a single street stair out to the SE corner of Broadway & 48th Street, there are a couple of High Entrance/Exit Turnstiles to provide access into the system. 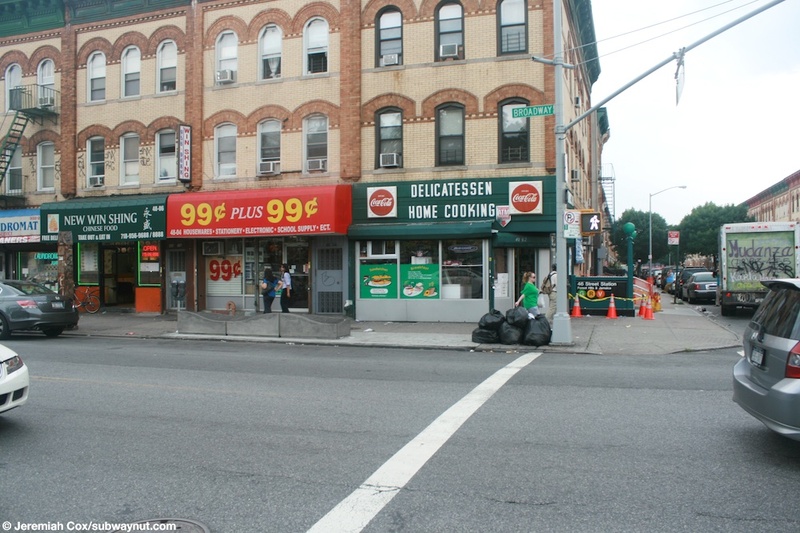 The Manhattan-bound platform has an exit here as well, a single street stair leads down form the northside of Newtown Road, a diagonal street, on its very short section cutting between Broadway & 48th Street. This entrance has turnstiles and is staffed during rush hours with two High Entrance/Exit Turnstiles for access at other times. 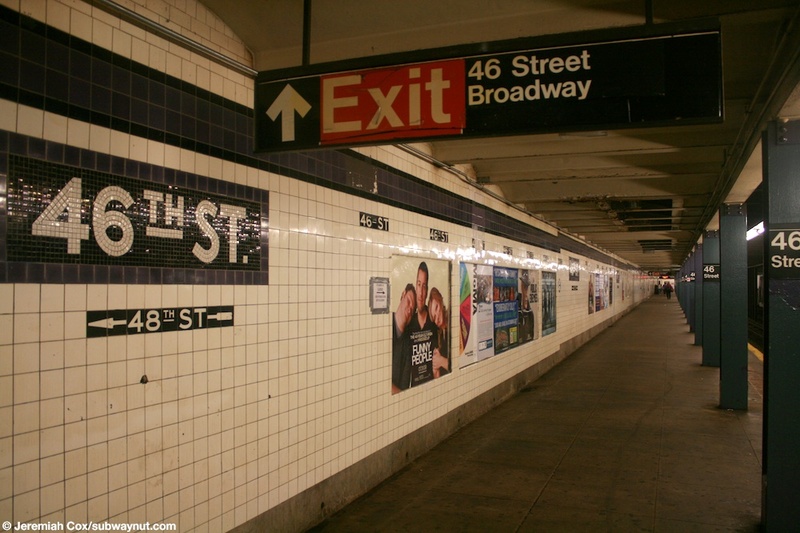 Each platform in their midsections also have evidence of abandoned exits that probably once led to 47th Street. 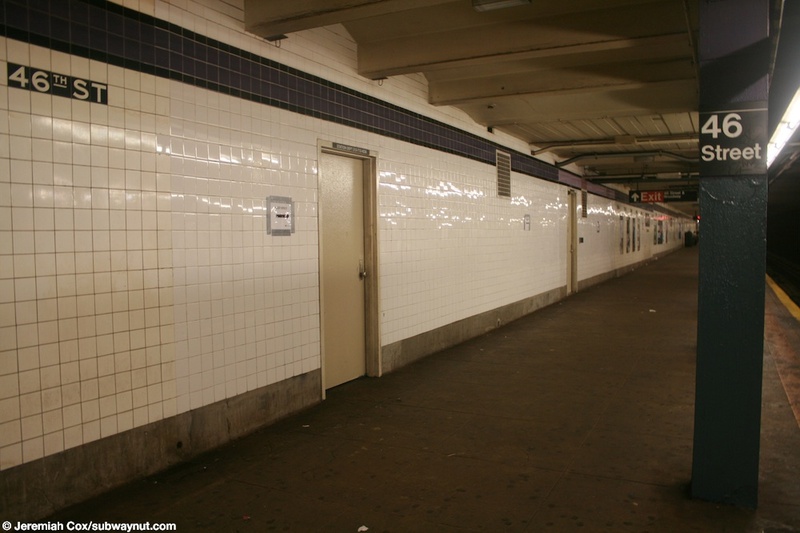 There is a newly tiled off section with doors on the Forest Hills-bound side, wile a fenced-off wider (with plywood visible) area on the Manhattan-bound side. The platform walls at the station have a purple trim-line with a black boarder, and name tablets that are white text on black with a purple boarder. Both platforms have I-beam style columns running along them that are painted purple. 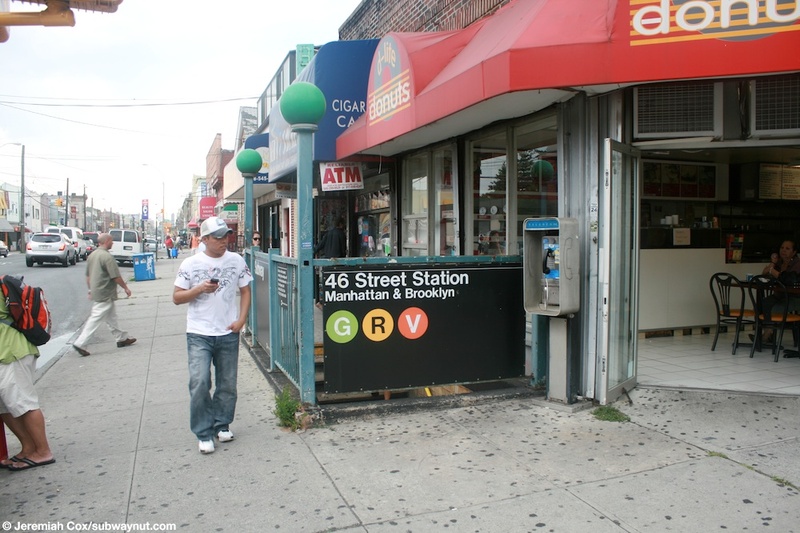 (46r1) The street-stair entrance at 46 Street to the Manhattan-bound side of the station. 5 October, 2003 (46r2) A close up of the entrance down to the Manhattan & Brooklyn platform at 46 Street Station. 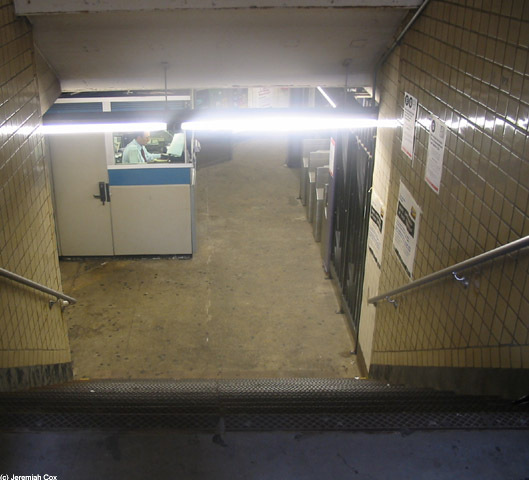 5 October, 2003 (46r3) Looking down the staircase to 46 Street and the Token Booth that faces the turnstiles that provide the entrance to the Manhattan-bound platform. 28 July, 2009 (46r4) Looking down the Forest Hills-bound platform at 46 Street, the 48 Street exit has been closed for two months to allow the entrances only street stair to be upgraded with the step up and than down to enter design to reduce water that could flow into the station during heavy rains. 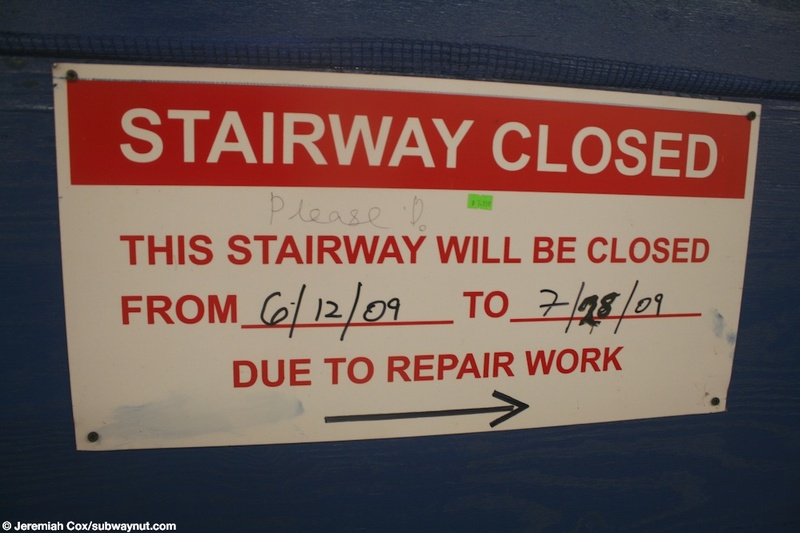 (46r5) The signs says Stairway Closed (really should say Exit Closed) from 6/12/09 to 7/28/09, its the 28th today, I wonder if its about to re-open at the 48 Street exit from the Forest Hills-bound platform at 46 Street. 28 July, 2009 (46r6) A 46th St purple name tablet with the directional arrow for the 48th St exit beneath it. 28 July, 2009 (46r7) Another view down the simple, narrow Forest Hills-bound island platform at 48 Street. (46r9) Looking across to the Manhattan-bound platform at 46 Street at a wider now fenced off plywooded area in the center of the platform, this was probably the exit to 47 Street at some point in time. 28 July, 2009 (46r10) Looking down the Forest Hills-bound platform at 46 Street, towards that exit from the station. 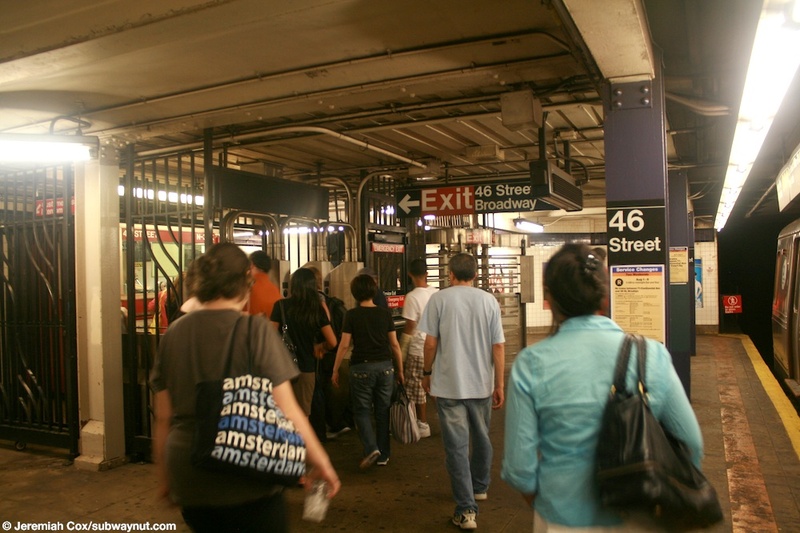 28 July, 2009 (46r11) Passengers approach the turnstiles to leave the station at the only currently open exit at 46 Street. 28 July, 2009 (46r12) The recently outfitted for flood protection Forest Hills-bound street stair at 46 Street. 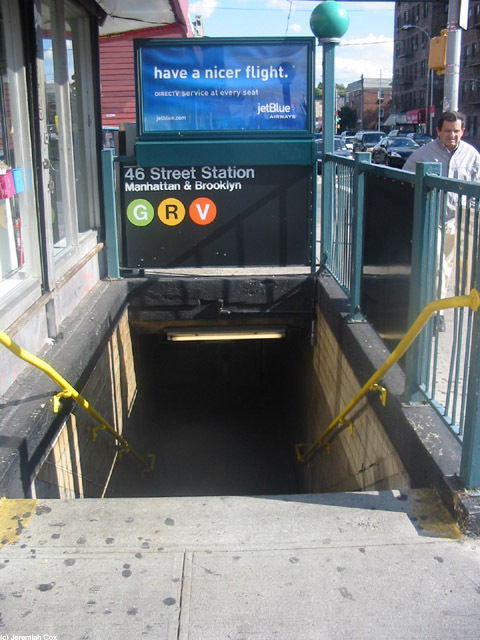 (46r13) An older looking, and non-standard street stair for the Manhattan-bound platform at the 46 Street entrance. 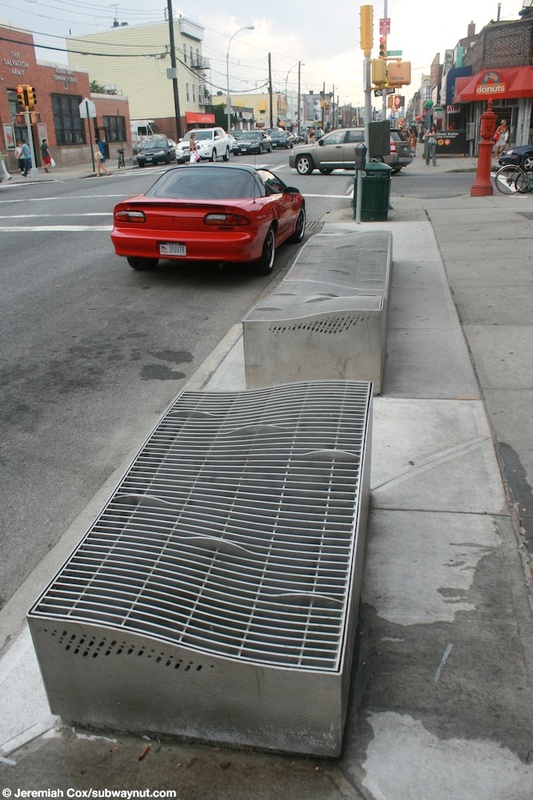 28 July, 2009 (46r14) The raised flood protected sidewalk grates along the sidewalk of Broadway above the 46 Street Station. 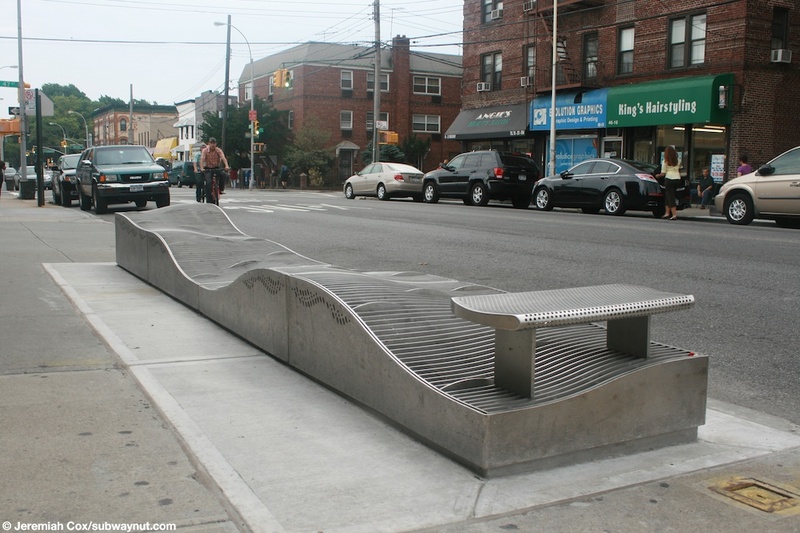 28 July, 2009 (46r15) Another raised sidewalk grate along Broadway for flood protection, this one has a very obvious seat on it. 28 July, 2009 (46r16) Looking across Broadway at a raised sidewalk grate for better flood protection and the closed for retrofitting street stair to the Forest Hills-bound platform at 48 Street.